General contractor for underground utility and street construction. LaTour Construction Inc. is a Central Minnesota based Union Sewer & Water Utility Contractor. We specialize in the construction of utilities and streets for residential, commercial & industrial developments, as well as municipal utility and street reconstruction projects. We are located in Maple Lake, MN and are a knowledgeable source for questions pertaining to the feasibility of land development. We know and understand the geographical challenges that we face throughout the Central Minnesota area from our many years of experience installing municipal sewer & water projects and road reconstructions. Our work force has the practical knowledge and skill needed to do the job right, using the most efficient options to complete your project on time and within your budget. We provide excavation services for private developers, municipalities, and government agencies. 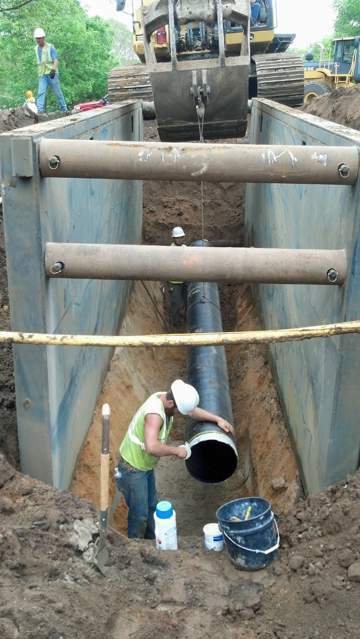 Projects include large and small municipal sewer & water reconstructs and new subdivisions, such as installing underground utility services for sanitary sewer systems, water distribution systems, storm drainage systems and road reconstructs. We employ a skilled and dedicated work force that is proud of their work. We have found that the key to success is mutual respect for our customers and our employees. Since we first began installing underground utilities back in 1976, our employees have always been the key to our success. Hiring and retaining very talented and trustworthy employees that share our work ethic assures that there will be fewer problems, so projects are routinely completed on-time and within budget. This in turn means our customers are satisfied with our competitive pricing, quality of work and ease of communication. Heavy excavation demands safety first and foremost in everything we do. Our heavy equipment operators and laborers have years of practical experience and the ongoing safety training that is necessary to operate our heavy excavation equipment and complete our underground work. All employees follow the AWAIR safety policy and have continuous safety training and inspections throughout the year, plus our seasoned work force has many years of real-world experience. Most importantly, all of our employees understand that they are “thinking workers” who have an obligation to their families, to themselves, and to the company, to be safe and efficient workers. Call us for your next underground utility or street construction project. Please call our office at 320-963-5993 to discuss your next project, or click to send us an email.